‘The energy of people who are walking the talk of peacebuilding exists throughout this space,’ Joe Heikman says. 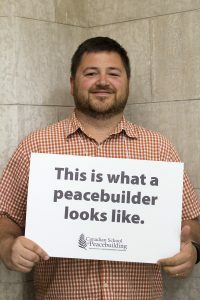 An ongoing interfaith dialogue that his church is having with a nearby Muslim community led Joe Heikman to the Canadian School of Peacebuilding (CSOP). Heikman, pastor at Wildwood Mennonite Church in Saskatoon, SK, came to Canadian Mennonite University (CMU) in June 2017 to take the course Peace Resources in Islam and Christianity. Heikman enjoyed the course, taught by Dr. Mohammad Shomali, founding director of the International Institute for Islamic Studies in Qom, Iran, and Dr. Harry Huebner, Professor Emeritus of Theology and Philosophy at CMU. The CSOP often takes place during Ramadan, and organizers offer students who observe the annual month of fasting a food package that allows them to eat before dawn and after sunset. Although he is not a Muslim, Heikman chose the Ramadan food package. There were two reasons for this decision. “This is a course about common ground between Christianity and Islam, and fasting is part of both of our traditions,” he explained. “It’s something I could participate in that’s true to both tradiations. That’s half of it. In a letter to Saskatoon’s StarPhoenix newspaper, published in June 2016, Heikman noted that “Christians have much to learn from our Muslim neighbours about Islam…, about the nature of faith and spirituality, and about ourselves as new friendships invite us to consider our own assumptions and ways of life. In that vein, Heikman was struck at the CSOP by Shomali’s teaching about the continuity between Judaism, Christianity and Islam as one ongoing story of the Abrahamic tradition. It showed him that Jews, Christians, and Muslims are starting from the same place when engaging in interfaith dialogue. He added that he was happy with his decision to study at the CSOP.